The dashboard is undergoing a major rewrite, and we’re ready for you to give it an early look. Would you like to pitch in and hunt bugs? Read on! A revamped beverage tapper. 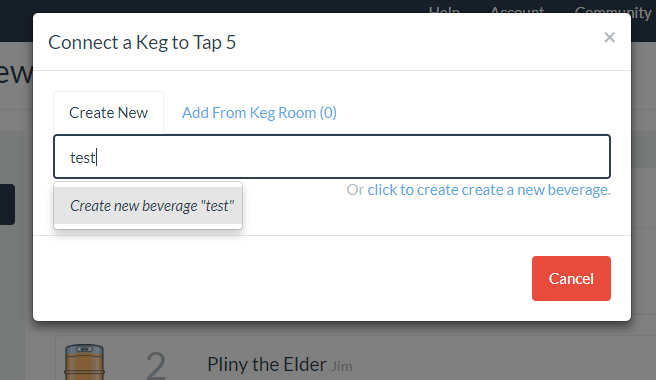 You can now enter “advanced” information when creating new beverages. A revamped Look and Feel settings page. Settings are now better organized and collapsible by group. 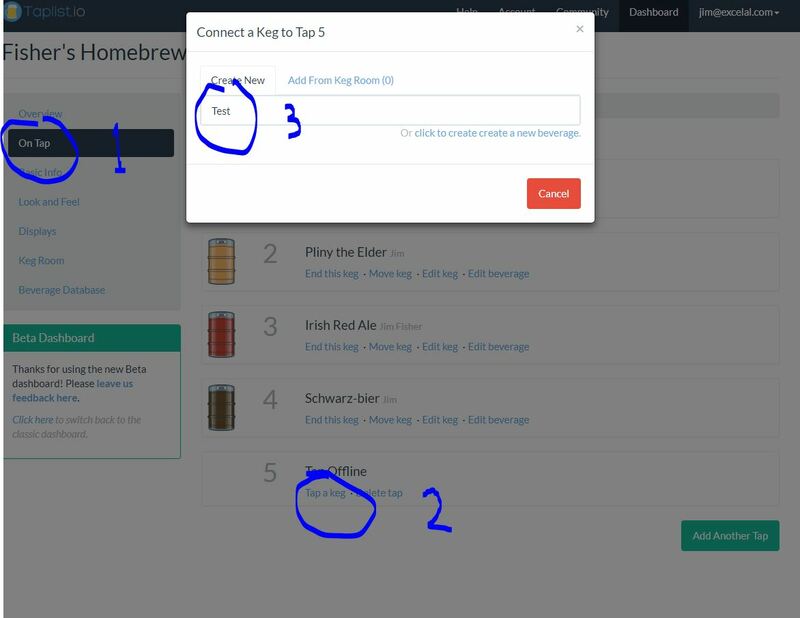 Quick actions in the Keg Room to move, edit, or connect kegs directly. Quick search in the Beverage Database to jump straight to a beverage. But more than these features, the new dashboard is a complete rewrite in a new framework that should make it easier and faster to support new features. In other words, the most important thing is that it does everything you’re used to, just as well if not better. How do I opt-in or opt-out? Note that you may be asked to log in again when switching to the new dashboard. This is expected. Give it a spin, and please leave your feedback here: The good, the bad, and the ugly. I’ll keep this post up-to-date with known issues and their resolutions. Much prefer the look and feel of the new beta. However it doesn’t seem possible to link to and edit the Producer via the Beverage DB. I appreciate the feedback! I’ll look into these bugs, sound legit! Yep, same here; I can’t save my tap once I create it. You’re definitely on the right track with these improvements. Cool! Also, I should be able to “add a keg” while in the Keg room. I have a fundamental problem for both dashboard and dash. I’m using Dense Layout with 4 columns. It shows correctly on the preview, but my actual site always shows only one column (as if I was stuck on Griddy 2.0). I’ve checked this on several computers, all with large monitors and fully updated Chrome. FWIW, I also never get snow, although not a big issue. Thanks for the report (and feedback!). Would you be able to share or DM a screenshot of the place things are getting stuck? Screenshot one is from “dash.” 1, 2, and 3 are the clicks I make. I try to make a “test” keg and there is no “save” or “create” button to press.
. . . .And now that I’ve gon to all the trouble of typing all this, I see my error (or perhaps an area for improvement?). When type in a new beverage and press the tab key, I’m looking for a “save” or “create” button. But if I just start typing and DO NOT hit the tab key, there is clearly a dropdown there that says “create” which, when pressed, gives me the ability to edit and save. Cool! Ah thanks! Now I understand what’s going on. Sounds like we need some visual feedback / progress bar while it tries to autocomplete, which is the delay. Wow! Thanks for all the work on this! Adding a new beer seems pretty complex now. 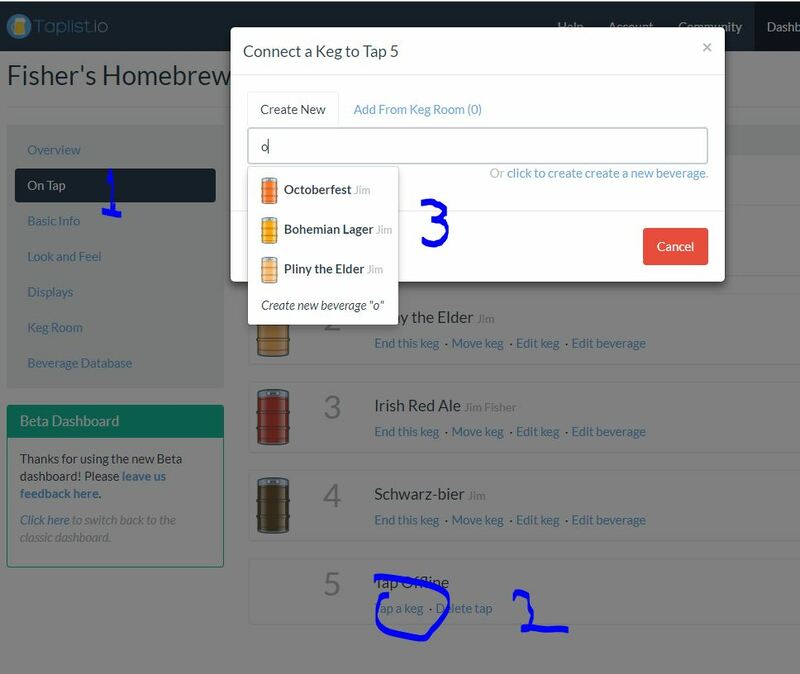 I went to add a new beer and had to do it through what’s on tap rather than the beverage room. Isn’t there a button “add beverage” or something in the old setup? You’ll now see beverages and producers side-by-side. The new dashboard looks great! The issue I’m currently seeing is that the background images don’t seem to show up anywhere but in preview mode. Is this feature not fully implemented yet? Can you try reloading your display? It should show up automatically. Take a look - it should be a wood panel background. I’ve tried switching it to other backgrounds but it just never seems to work for me. I’m still having issues creating beverages in the new dash. Filled out all the usual information and the ‘create’ button is unresponsive. I’ve switched to Vivaldi (was previously using chrome, but Vivaldi is based on chrome too) so if its browser dependent its an issue with the chrome code base. Ah, bummer! Would you mind screenshotting the place where you’re getting stuck?